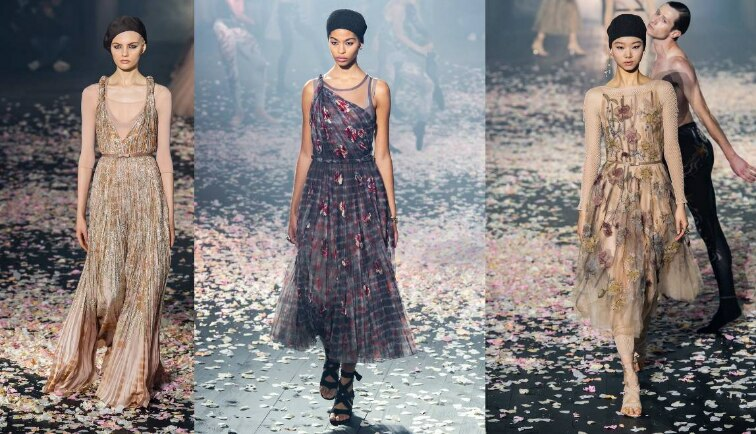 Linking dance to fashion, Dior's Maria Grazia Chiuri's latest collection was about freedom as she replaced restrictive silhouettes such as corsets and underwires with light and flared out neo-Grecian skirts made out of tulle. Chiuri collaborated with the famous Sharon Eyal to choreograph a production for the show. As the rose petals were showered, dancers moved to the soft beats of the music, and models displayed the sublime-yet -edgy collection—the Dior show was really fashion in motion. To accentuate the dreamy and romantic vibe, white was a dominant colour in the collection. Fishnet was the defining element of the collection as it was used as a layer over and under dresses and jackets which provided an edgy vibe to an otherwise delicate collection. Eccentric and whimsical prints were used to juxtapose the whimsical and princess-ey silhouettes. Going with the theme of freedom and flexibility, tulle was used extensively. Abstract prints used in relaxed silhouettes caught everyone's attention. Aside from dreamy floral prints, ombré, and tie-dye, various patterns were also seen on the runway. Maria Grazia Chiuri continued to defy fashion norms as her latest collection demonstrated that fashion is no more about restricting women but liberating them.